If the words "Shopbop" and "sale" make your heart race, you've come to the right place. Every fashion girl's favorite e-tailer has thousands of items on sale right now (because August is summer-sale month), and starting today through August 24, they've discounted an assortment of pieces for an extra 20% off. Covetable brands like Tibi, Rag & Bone, Ulla Johnson, and Re/Done are included in the mix, which means deciding what to add to your cart can be overwhelming, to say the least. Accordingly, we did the preliminary shopping for you and narrowed the offerings down to our 10 favorites (you're welcome). Shop our Shopbop picks that are an extra 20% off below! 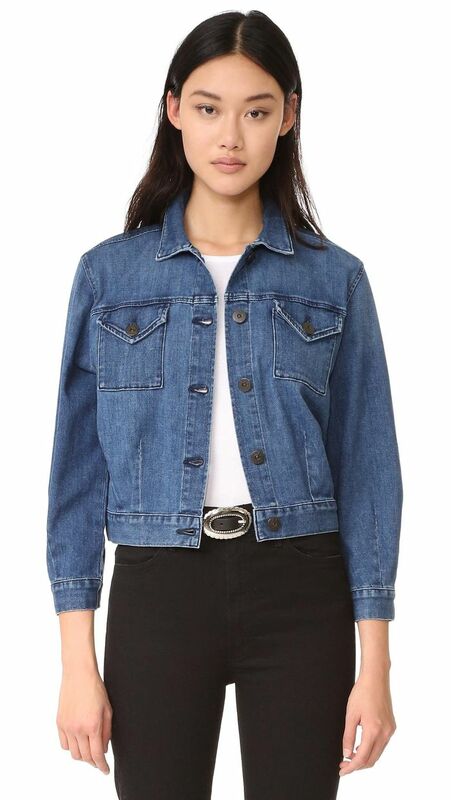 Denim jackets don't get much more flattering than this. You'll want to wear this cute top straight through fall. These playful slides are nearly 50% off. Try the stirrup-jeans trend for a mere $31. Behold the chicest army jacket ever. You'll want to wear this cool dress everywhere until the weather cools down. Don't worry—you'll still want to wear this chic one-piece next year. Ulla Johnson dresses don't come cheap, so snag this marked-down one while you can. Another dress we suggest not letting get away. These would make perfect travel jeans. Next up, find out how to dress like a millionaire, no matter your salary.